Horchata – Rum Spiked or Not? I wouldn’t normally write a post about Rum, but when I opened the box from Shellback I was inspired! First off the box was personalized just for me, how cool is that? When I opened it up, inside I found a very funny certificate (pictured) about the Rum. The packaging was flawless, each bottle nestled in a pillowed covering and unharmed. ” Sourced from some of the finest Caribbean sugarcane, and blended with twelve spices and other natural flavors, Shellback is a modern rum for discerning palates.” The website is really fun….check it out! I thought, how can I write about booze on this blog? Then it hit me…it’s holiday time and I bet you need a break, just a small moment of peace, something that the kids will like while mommy or daddy relax too. Growing up I never had Horchata, that sweet, cinnamon-y, creamy frothy beverage. We had Knishes, Matzoh balls and occasionally chinese take out! Mexican food in the 70’s in Upstate NY was just not something we had. Since I moved to the Pacific coast I have been introduced to so much fun Mexican food and Horchata is one of my favorites. Some say Horchata has roots in Egypt, Spain and then Mexico, Some use almonds some use rice as the base, either way it is a deliciously sweet indulgent treat. Traditional Horchata is dairy free, made only with rice or almond milk. If you can’t have milk this recipe is easily made dairy-free, just skip the milk and condensed milk. So make up some tacos and Horchata and for dinner and spike yours with yummy Shellback Rum! The kids can have theirs too but make sure to keep the rum all to yourselves! This recipe will come out best if you have a high powered blender like a Blend Tech or Vita Mix but you can use any blender or food processor. Mix the rice and warm water together in a bowl, and let stand for about an hour. Drain the rice and reserve the water for later use. Place the rice in a blender, add the cinnamon and process until a paste forms. (you may want to add a bit of the reserved liquid if it too thick) Return the rice to the water and let stand at least 2 hours, stirring occasionally as the water turns milky white. Strain the rice through a fine strainer into a bowl or pitcher. Using cheesecloth in a strainer will give you the best results. Stir in the milk, condensed milk, vanilla until evenly blended. Refrigerate at least 2 hours. Before Serving toss in the blender or use a stick blender to froth. Pour the chilled horchata over the ice, add even amounts of rum to glasses. For the kids OMIT the RUM!! If you are looking for some other rum drinks check this out. Having a baby is joyous, scary, exciting and tiring. When I was pregnant with my daughter my husband and I were scared to death but there was one piece of mind that helped. This book never left my bedside, can you guess what it was? Yes, What to Expect was my bible; even my husband got into the information book had to offer. I would read it to him, skipping the graphic details (he’s squeamish) I also remember reading excerpts over the phone to other pregnant friends, “hey did you read this, it’s crazy, can you believe what we are in for?” Squelching our fears and supporting each other, was important for us new moms. I think this book really helped us stay calm and rational, for a while anyway! The baby came and it all worked out. By 3 months I found myself flipping through the book desperately searching for new information. I must have been hormonal because I read that book cover to cover many times and there was no new information appearing on the page. I must have thought that some magical ink was going to appear or some new pages would materialize! The good news was that there was another book…What to Expect the First Year, the bad news, I was way to tired to read it! It’s true people, babies make you tired! I did manage to read it and again we made it through. 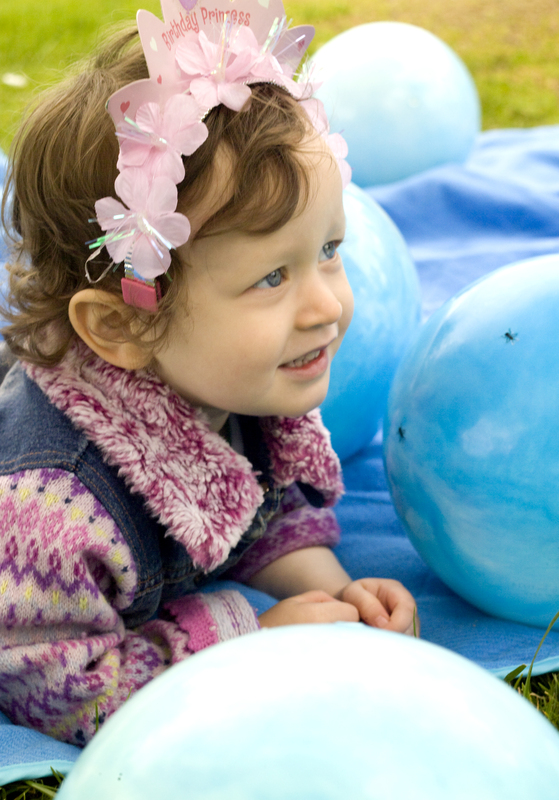 Once the baby turned two I found myself again looking for the magical ink to morph into new tips on two-year olds! 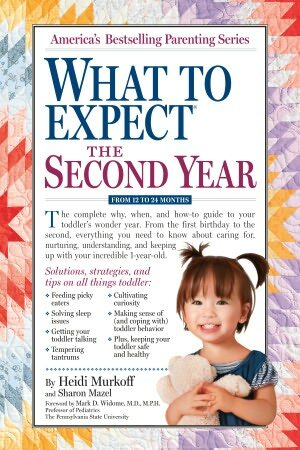 Unfortunately the What to Expect The Second Year had not been written yet so we just muddled through on our own. The best part of having the two guides was that I started to think about how to feed our picky toddler and all our toddler friend’s kids. That is how my book Toddler Cafe was born, I was inspired by these baby guides and created my own book. So, use these books for peace of mind, and to start dialog with other moms and dads who are going through the ups and downs of parenting. You can even use them for inspiration, once you get rid of your “mommy brain” and all your brain cells are firing again! Visit the What To Expect site to get more information on all kid related tips! They have a Facebook page too! I am so excited to be able to give away all three of these books to one luck winner, so if you are pregnant or know someone who is, make sure and enter enter to win! When leaving a comment make sure you leave your e mail address, if I don’t have it I can’t contact you. Share on Facebook. Make sure you tell me you shared by commenting on my Facebook page that you did! Make sure to ‘Like’ my Facebook page! By the way…my baby is NINE! One winner will be chosen at random. Winner will be chosen in Novato California on November 9th 2011 at 10 am. The winner will be notified via email within one week after the draw. The winner will be required to provide an address to ship the two prizes to the address only be used for shipping purposes. DISCLAIMERS: All federal, state, and/or local rules and regulations apply; void where prohibited by law. Jennifer Carden is not responsible for late, misdirected or illegible entries. Winners are responsible for any and all taxes associated with their acceptance of any prize. Jennifer Carden is not responsible for technical, hardware, software, telephone or Internet access failures of any kind, lost or unavailable network connections, or failed or incomplete, garbled or deleted computer or network transmissions which may limit the ability to participate in this sweepstakes. Sponsor reserves the right at its sole discretion to cancel or suspend this sweepstakes or any part thereof should virus, bugs, unauthorized human intervention or other causes beyond its control corrupt or affect the administration, fairness or proper conduct of this sweepstakes, including terminating just one phase or portion of the promotion. When the company asked me to come up with a recipe for a new flavor of cheese, I agreed of course. A few weeks ago I received a box in the mail containing some Laughing Cow cheese and other yummy snacks. The flavor they sent over was Light Queso Fresco & Chipotle cheese, spicy and creamy I liked it right away. The spicy flavor lingers so you don’t need to gobble up a bunch, one wedge was very satisfying. With only 35 calories per wedge this is a good low cal snack. The Laughing Cow cheeses have been around for as long as I can remember, you may have seen it in your airplane meal or in your lunch box. Little cheese wedges are not something I usually toss in my grocery cart but I may now. I wanted to create a recipe that was so easy anyone could make it, I also wanted to use ingredients most people have on hand. This particular cheese is spicy, but if you’d like to make this for the kids try any of the other Laughing Cow flavors, Swiss or Garlic and Herb would be just as delicious. I use cilantro in this recipe so if it’s not your thing substitute with parsley, get creative. Try adding leftover diced chicken or bits of broccoli! These would be great for a lunch box or appetizers at a party or just a game night snack. An unsweetened whole wheat bread works best for this recipe but white bread will work just as well. Cut crust off bread, using rolling pin roll bread as thin as you can get it. Spray or brush standard muffin tin generously with olive oil. In a large measuring cup mix eggs, milk, cilantro, red peppers, salt and pepper. Mix well using a fork to break up the eggs. Place the bread cups in the preheated oven to crisp for ten minutes. Remove from oven, while hot place one triangle of cheese in each bread cup, pour egg mixture over each. Wait 30 seconds for egg to be absorbed and top off each cup with remaining egg. Bake for 20 -25 minutes. Cool slightly, eat! I love Twitter, I have made many friends on Twitter but the best part of all my Tweeting is getting lots of yummy snacks delivered to my front door. Last week I was messing around on Twitter and I got a Tweet from @pretzlecrisps on Valentine’s Day, to say they were sending the love in the form of snacks. The funny part is that the next morning there was a huge package on my front stoop and it was hand delivered, not my mail. Look at all that schwag, a case of all the flavors of Crisps, a serving bowl, beer cozies, grocery lists, pens, humus, salsa, and my favorite chocolate almond butter from Justin’s. @Chefjen Adorable lunch idea, lucky kids! DM work addy & we’ll dlvr Pretzel Crisps snack packs, perfect for lunches or snacking, our treat! @Chefjen Are you up for a Pretzel Crisps delivery, our treat! DM addy, snacks on us! @Chefjen Special delivery on your front porch! Snack happy & let us know your favorites! 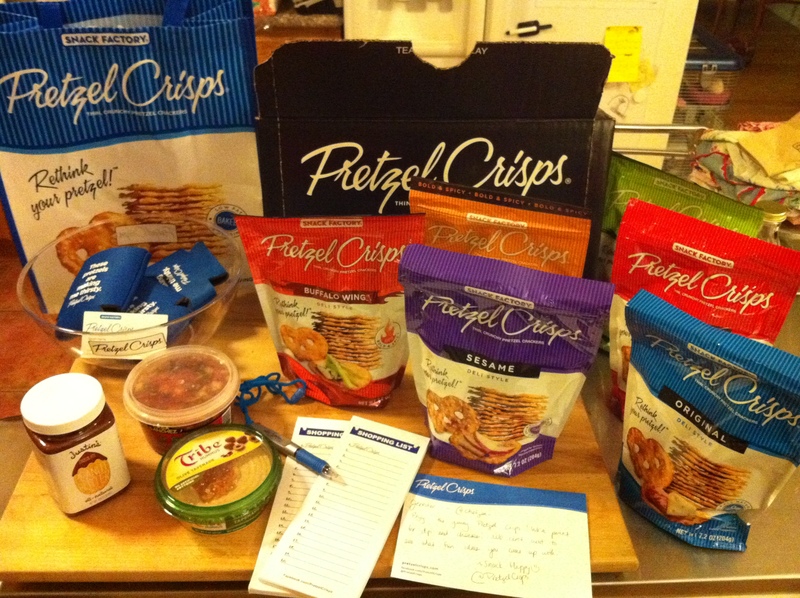 @PretzelCrisps and it wasn’t even in a box…you were here! Sorry I wasn’t home. @Chefjen Sorry we missed you, what a beautiful day! Enjoy the Pretzel Crisps & dips! The next morning my daughter was so excited to open the box and see the all flavors. We ended up tearing into the Original and Sesame right away we loved them instantly. I really am not a pretzel fan but I do love a crunch, so these made me smile. They can be filled with spread, dipped in chocolate or savory dips, crushed for coating on chicken, the possibilities are endless. I saved the spiced ones for some out of town guests, I didn’t think the kids would appreciate the spicy flavors. We decided to get creative and my daughter suggested we make nachos with the Pretzel Crisps. Being salty and crunchy we thought the crisp would hold up to baking and they did! 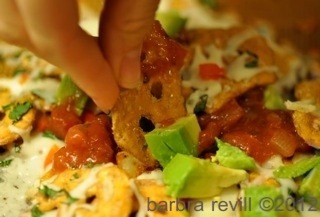 We made a quick version of nachos but the possibilities are really endless. We decided the Jalapeno Jack flavor would work best as the base for our nachos. They are pretty intense right out of the bag especially if you are not used to eating chips and flavored bagged snacks. After we laced them in cheese and drowned them in salsa and avocado they balanced right out. I have to say as snack food goes these were pretty tasty and had a zing!! This is super simple to make, add beans, meats or anything you can think up!! This can be made with any of the Pretzel Crisp flavors we chose a spicy one but choose original for the kids. Line a baking sheet with a silicone mat or greased parchment paper. 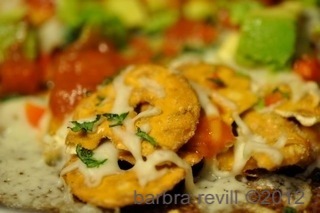 make one layer of pretzel Crisps, add half the cheese and cilantro, repeat with another layer on top. If you are using beans and meat or other veggies add them to these layers. Remove from oven and top with salsa and diced avocado. Note – We also made a batch with Raclette cheese, it melts extremely fast and ended up being delicious on the Crisps. Raclette – Swiss or French alpine cheese with a nutty flavor and silky, smooth texture. Celebrate the launch of Chef Jen’s Facebook page! 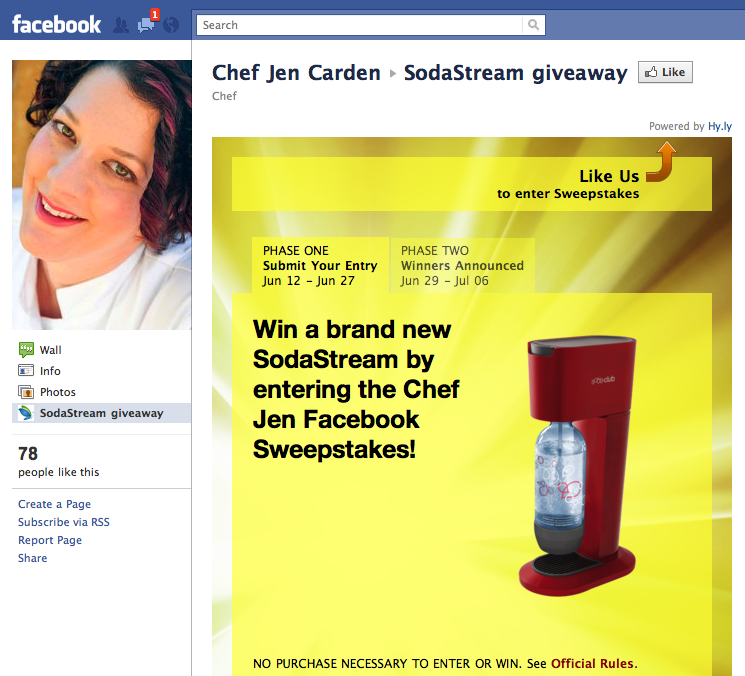 Enter the Chef Jen Carden Facebook Sweepstakes and you could win a grand prize — a fancy new SodaStream soda maker. The SodaStream turns tap water into sparkling water in under 30 seconds! It’s one my favorite kitchen gadgets. The contest ends on June 27 and we will be contacting the winner via email and also announcing it here on my blog. I will be closing down the old Toddler Café Facebook Group soon, so thank you for joining me on my new official Facebook Page. As a busy working mom I am always looking for ways to cut my meal preparation down. Even though I am a chef and I love to cook, after a long day of standing around in the kitchen the last thing I want to do for dinner is chop, mince, and zest. These three kitchen helpers are things I love and use almost everyday and make my life easier. Narrow Measuring Spoons: I love these because they fit into small spice jars easily. They stay nice looking after lots of uses and nest well. Trying to get a round spoon into a small jar is not something I need to be wasting my time on. 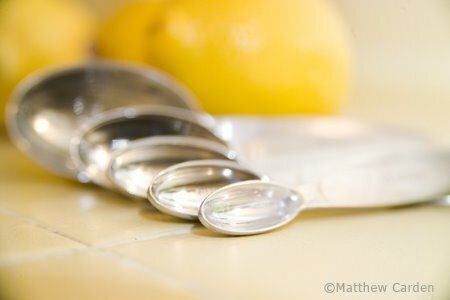 before I got these, I seemed as if I tried all of my toddler spoons trying to get the spices freed from their jars, not anymore! Safety Chopper: When my friend Michelle over at What’s Cooking suggested this tool for our kids cooking classes I was sceptical. Well, never say never I love this tool! I distinctly remember saying, “Oh I have knife skills I will never use this in my kitchen.” (eating words) Now I use it all the time, not just with my 5 year old but on my own for nuts, onions and so on. The kids do get a kick out of using it and it gives them confidence. I tell them to wind up and hit it with all their might, the silliness gets everyone laughing and having a good time. 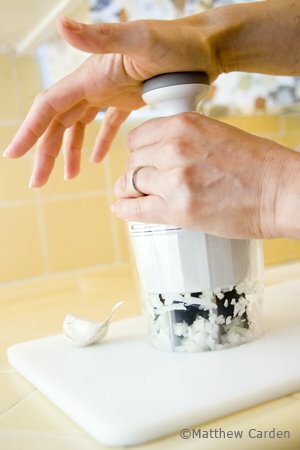 Micro Grater: I use this for everything!!! This particular one has a long slender surface with small grater holes. 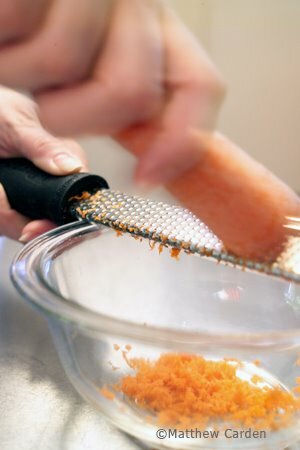 Its ordinary purpose is for things like zest or grating Parmesan cheese but I like to use it for things like apples to make “applesauce,” and finely grated carrots. The thing I love it for the most is grating frozen ginger. I keep chunks of ginger in the freezer for adding to tea and stir fries, it glides easily along the grater when frozen. I just take the frozen ginger and grate the desired amount right into the bowl or pot give it a bang and all the ginger I need is deposited!! "I Can Make Can Cakes, Can You?" I never thought I would, really I didn’t. Should I tell you? OK, while browsing the isles of Whole Foods as I do (really it is for work I just have to spend long hours wandering around the grocery store.) How do you think I get most of my ideas? Mostly I just walk around in a daze while my brain and eyes take in the plethora of ingredients. I saw a new product called Batter Blaster, at first I walked on by ignoring it’s draw. It’s shiny yellow label, it’s tall canister filled with pre- mixed organic pancake batter. My better half knows this is over packaged and that mixing up pancake batter takes all of about… 3 minutes. But on the other hand we are planning to go camping and a spray batter would be so easy! See where I am going here I really wanted it, and I bought it, and….the family loves it. I don’t think I’d buy it all the time, but for once in a while convince food, I can see it. I do love the idea that kidlet wants to make her own breakfast and with this and some supervision she can. She has named them Can Cakes, I can’t decide if that is cute or scary, as long as she knows where the ingredients came from I am OK! It really is the perfect camping breakfast, you only need a pan, some butter and a spatula to make them. It would be so great if they could come out with a Gluten Free version so mommy can enjoy them too. Cakes are pretty light, very airy and less hearty than other cakes. I have to go to Whole Foods or Costco to get them.